← Primark, New Look, Boots and Superdrug haul + MUA news! This is technically my seventh and eighth daily looks, as I had two in that ‘missed’ post a few days ago! The top one was a trip into town to finish buying my mum’s presents, and the second was just to go to the supermarket… I felt like wearing a bit more than just trackies or something! I’m trying out taking the photos outside. I think the lighting is much better! Anyway this was an outfit thrown together with a few old favourites. 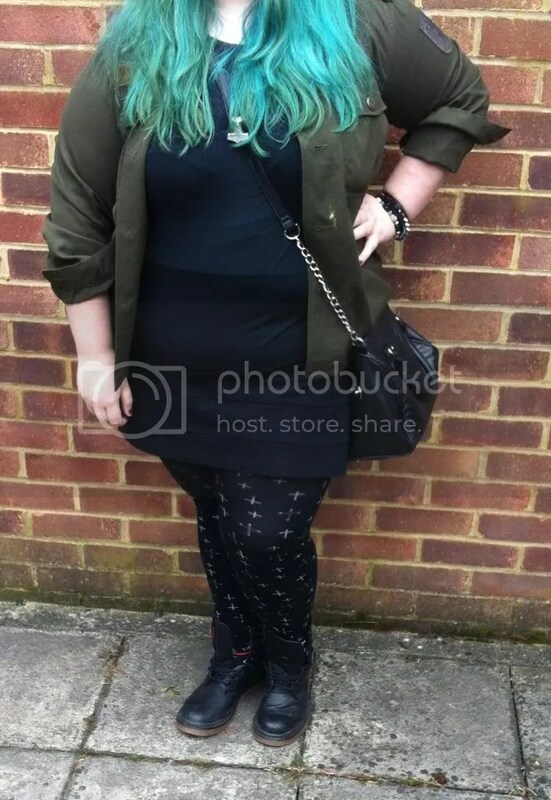 I’m wearing an Austrian Army shirt, from the army surplus stall at Bloodstock Festival in 2011, a black long-sleeved t-shirt from Greenhouse (a Scandinavian label), a black skirt from M&S (I think), my New Look crucifix leggings and my ShoeZone Doc-style boots. I also wore a collection of bracelets, and used my usual Primark shoulder bag. I apologise for how weird my legs look in this photo! This is the fake-leather jacket I got a few years ago from Matalan; I thought I’d lost it but my mum was hiding it with her excess clothes! Cheeky. 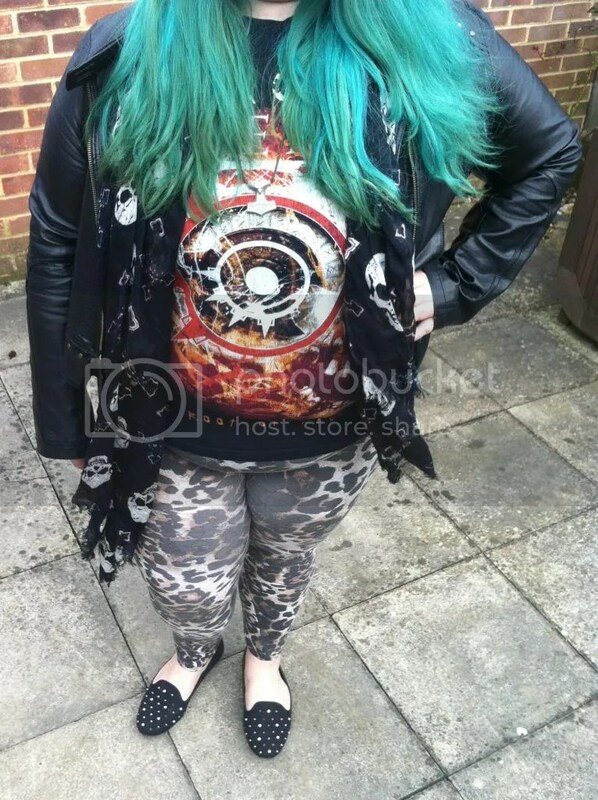 Underneath is an Arch Enemy band shirt I haven’t worn in ages, with New Look Inspire leopard print leggings, Primark studded flats (£6, absolutely lovely shoes!) and my new Primark skull and cross print scarf. I really liked this outfit! Also, here is a Face of the Day for you! The lipstick is Barry M number 121/Pillarbox Red, and it’s lovely! I can’t remember what else I used on my face, it was only a couple of days ago but I am that forgetful! I’m trying out a new shampoo and conditioner- Glad Hair Day and the Glad Hair Day intense conditioner for thick/fried/frizzy hair. So far, I am impressed! I need to use it a few more times before I can review but as you can see from the photo, one use left my hair bouncy but manageable. 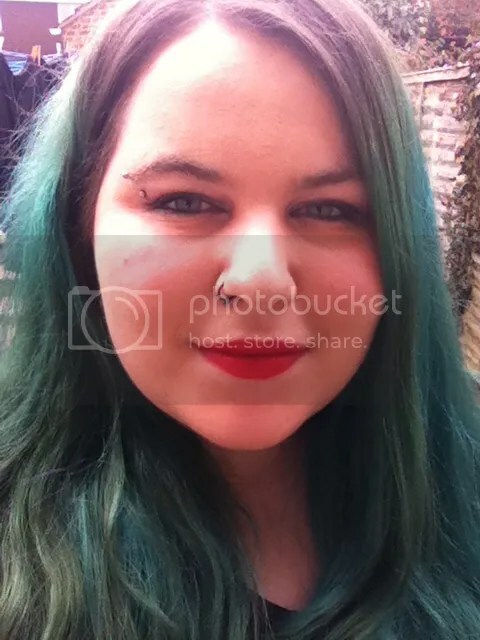 This entry was posted in Beauty, Hair, Makeup, Daily Look, Fashion- High Street and tagged beauty, daily look, FOTD, make up, OOTD. Bookmark the permalink.